Cute as buttons and tasty too, these fairy cakes are children-friendly: easy, light on washing up and made in minutes. Preheat the oven to 180C/350F/Gas 4 and lin 2 x 12-hole fairy cake tins with paper cases. Whisk the eggs and sugar together in a bowl until light and fluffy. Carefully fold in the flour and butter. Pour the mixture carefully into the paper cases. Bake the cakes for 15-20 minutes, or until golden-brown on top and a skewer inserted into one of the cakes comes out clean. Set aside to cool for 10 minutes on a wire rack before removing from the tin. To make the buttercream, beat the butter in a large bowl until soft. Add half of the icing sugar and beat until smooth. Add the remaining icing sugar, cocoa powder and one tablespoon of the milk and beat until creamy. Beat in more milk if necessary to loosen the icing. Once the cakes are cool, spread the buttercream icing on top of the cakes. 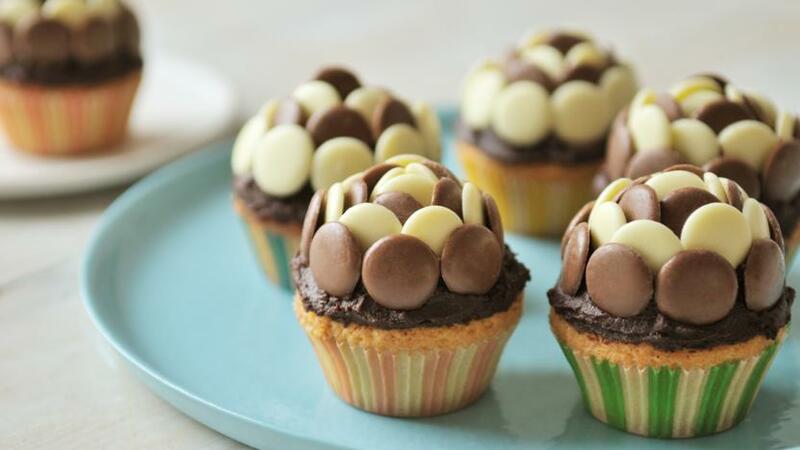 Decorate the cakes with the chocolate buttons.